I’ve lived in Oregon my whole life. I grew up on the Oregon Coast, spent my college years in the Willamette Valley and have been rooted in Central Oregon for more than two decades. I’ve traveled to every county in this great state, even making a career out of it as a writer — which might make me the luckiest girl in the world, and I always come back to Central Oregon. This region offers a real diversity of environment (and great weather), where you can enjoy mountains, lakes, rivers, waterfalls, deserts and forests all in a 100-mile radius. People often ask me about my favorite places and ask for recommendations of the places they shouldn’t miss on a visit to Oregon. 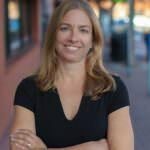 Here are my top 10 don’t-miss suggestions for Central Oregon. The Newberry National Volcanic Monument encompasses the biggest volcano in Oregon. Newberry Crater is a collapsed shield volcano formed by relatively recent volcanic activity, around 600,000 years ago. The giant crater shelters a waterfall, two lakes and the very awesome Big Obsidian Flow. The entire monument’s 50,000 acres contain one of the largest collections of cinder cones, volcanic domes, lava flows and fissures in the entire world. Drive to the top of the volcano, visit a lava tube cave, walk through a lava cast forest and see over 400 volcanic cones in the monument. The Cascade Lakes Scenic Byway winds past Mt. Bachelor into the Cascade Range, through a volcanic landscape dotted with many incredibly scenic alpine lakes. It’s a beautiful drive accessing a natural playground, with even a resort or two thrown in to serve up ice cream and beer. See a collection of pictographs on the rocks at Devil’s Lake Pass, fish at Wickiup Reservoir, hike the trail around Todd Lake, see wildflowers at Sparks Lake and see the headwaters of the Deschutes in Little Lava Lake. There’s a lot more going on here than sagebrush. The High Desert Museum is a comprehensive interpretive campus nestled in the woods, offering living history; exhibits covering Native Americans to butterflies to quilts to watersheds to fur trappers; outdoor pathways on which you can see otters, teepees, a homestead and a sawmill; live bats and black widows; and birds of prey that just might fly over your head. You could easily spend a day here — and you wouldn’t regret it. There are over 19 miles of riverfront trail to explore in and around Bend. The beauties of the Deschutes River Trail are its scenery and diversity. Some trail is paved and highly accessible, perfect for strollers and easy rambles. Other sections are rugged single-track passing by waterfalls and through ponderosa forest. Stroll the Old Mill District or hike to Benham or Dillon falls off of Highway 41. 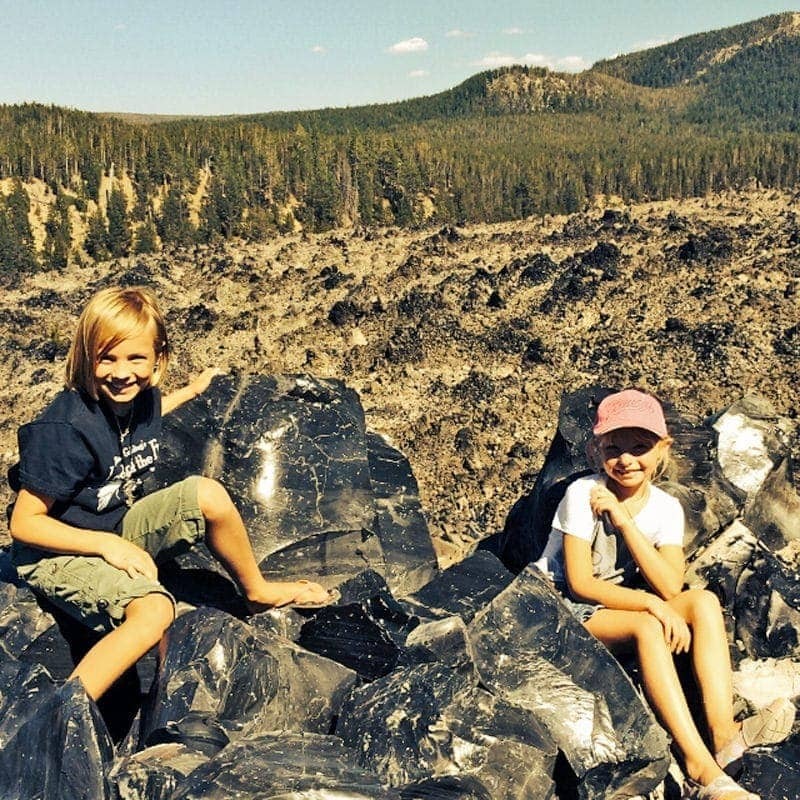 Bend is one of four cities in the United States that has a volcano within the city limits. Don’t miss your chance to hike up it! 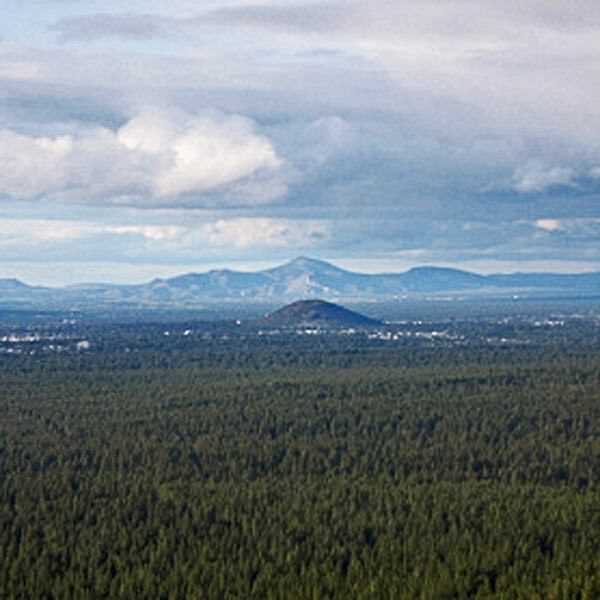 Pilot Butte State Scenic Viewpoint has long been a visual marker on the landscape, and today, there are two trails to the summit, at which you’ll be treated to incredible panoramic views of the Cascades, the vast high desert and the city. Bend’s downtown is a thriving concentration of great restaurants, scenery, shopping and entertainment. Park on the outskirts and walk around; make sure you descend into Drake Park along the banks of Mirror Pond for a knockout view of the Three Sisters over the water. See the pine tree growing through the dining room at the Pine Tavern Restaurant, sip a beer at Bend’s oldest brewery, Deschutes Brewery, find the hidden rooms at McMenamins Old St. Francis Hotel, and learn about Bend’s history at the Deschutes Historical Museum. Highway 242, also known as the Old McKenzie Highway, was the first route over the Cascade Range from Eugene, originally a wagon road and then the first highway. Today it’s part of the McKenzie Pass-Santiam Pass Scenic Byway traveling through an incredible volcanic landscape with amazing views of the Cascade Range. 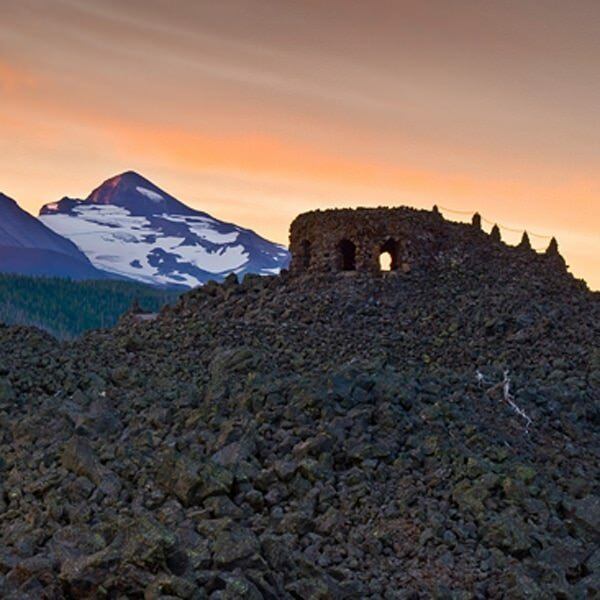 Visit the Dee Wright Observatory, built of lava rock and including peek-through, open-air windows with mountain identifiers and nearby lava trails to explore. This town is known for its Western charm and atmosphere. But it’s not exactly an accident that Sisters looks like a set out of a Western movie. In 1978, the town passed an ordinance requiring 1880s-style storefronts. It’s a fun, easy town to stroll through, with great little shops and fun eateries. Shop for cowboy boots at Dixie’s, grab a soft serve at Sno Cap, see some of the famous quilts for the Sisters Quilt Show at the Stitchin Post, fill your cup at Sisters Coffee Company and sip a beer at the Sisters Saloon. It’s not every day that you see a river spring from underground, or as it appears, from a rocky, fern-covered hillside in the woods. The Metolius forms from underground springs and appears near Camp Sherman, before running its short 29-mile course to terminate at Lake Billy Chinook. The headwaters are conveniently accessed by a short, paved quarter-mile trail that also boasts a killer view of Mt. Jefferson. 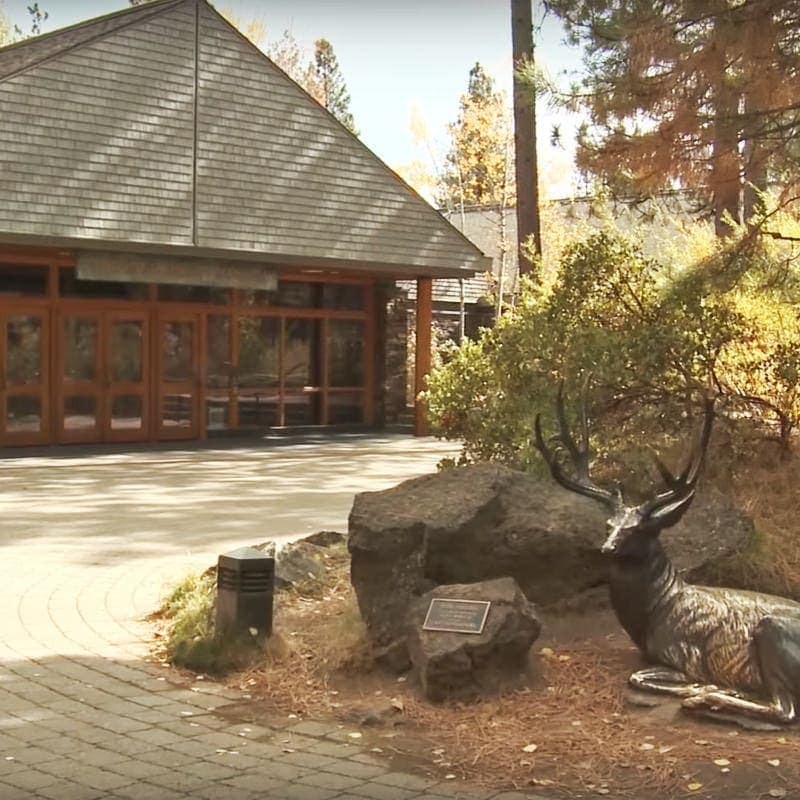 Camp Sherman itself is a small, forested community at the base of Black Butte that reliably delivers a peaceful, nature-infused, old-timey getaway. The incredible orange-blue-grey spires that reach to the sky, contrasted with the blue sky and the Cascade Range in the distance, all make this place unlike anything else you’ve seen. Smith Rock is at once quintessential high desert Oregon and a magical destination that could be on the moon. Smith is comprised of welded tuff from volcanic ash cloud deposits, and is an equally great destination for world-class rock climbing to easy day hiking. Please be aware that the park gets crowded in high season and parking is limited. Visit during non-peak season on a weekday and carpool — or even better, pedal there via the Sisters to Smith Rock Scenic Bikeway. Remember to always, in each of these places, practice Leave No Trace principles to keep Oregon the beautiful place I’ve known and loved my whole life.